Formally the Encierro or bull running was the transfer of the fighting bulls through the streets, along an 850 metre route, from point A (the pens at Santo Domingo) to point B (the bullring). This transfer, which used to be a necessary part of the bullfight, and which is no longer the case today, lasted approximately two and a half minutes and was conducted with some 3,000 onlookers. However, as we are all aware, bull running is a great deal more than this cold and objective description. The bull run, which is the most important act in the San Fermin fiestas, has become the symbol of Pamplona and has given the city international fame. Each morning the bull run mobilises 3,000 runners, 600 workers, 20,000 spectators in the streets and bullring, plus a further million people watching the run on TV. It can therefore be affirmed that never in Pamplona have so many pairs of eyes scrutinised each square metre of the streets than at eight o'clock in the morning on the 7th July. 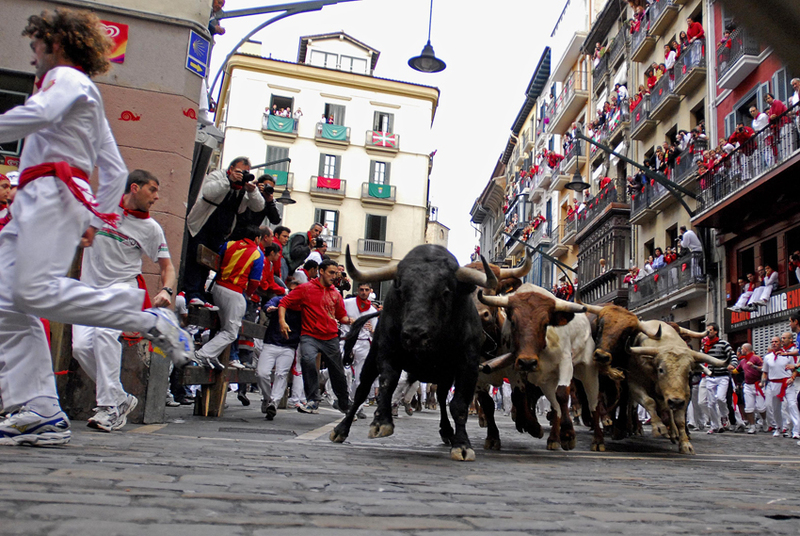 Although the characteristics of the bull run, such as amateurism, make it comparable to a sports contest - with rules, participants who are almost all in uniform, a specific route, spectators and someone to indicate the start and end - the Encierro can never be defined as such because there is no winner. Furthermore, this act which is synonymous with Pamplona, an event which is an ancient ritual, a self-imposed challenge for the runners, set on continuing with this age-old tradition, can never be considered a sport. Given the voluntarily assumed risk of death or injury, the fear which causes a knot in one's stomach, the underlying tragedy and the widespread violence, the Encierro has been defined as "collective madness", a "game of staying alive", "primitive irrationality", "an initiation rite to prove virility" and an "exaltation of bravery". However, it is true to say that this is no crazy race governed by collective panic, neither is it a great escape or "every man for himself", instead it is organised anarchy, with its own internal rules in which the essential factors are not what they first appear to be - fleeing from the bulls - but rather getting as close as possible to them. Because men are always attracted by a challenge, human frailty against the brute force of an animal capable of killing us by the simple movement of its head.